As technological advancements have reshaped so many other avenues of life, so too have they transformed the HVAC landscape. For years, homeowners put up with the pitfalls of traditional ducted heating and cooling. Now, thanks to newer ductless alternatives, cost-effective and customizable comfort have finally come within reach. If you were to visit a handful of American homes built within the past 50 years, you would discover a variety of architectural styles and floor plans, but probably only one type of HVAC system. Indeed, among the mechanical components at the heart of the average home, there’s one ubiquitous sight—ductwork. Despite being so common, ducts are infamously imperfect: Their tendency to leak creates significant inefficiencies that force the heating or cooling appliance to work harder than necessary. And of course it’s the homeowner who ends up paying more in monthly utilities to make up for the fundamental flaws of the system design. Though traditional forced-air systems remain prevalent, heating and cooling technology has advanced by leaps and bounds in the years since ductwork came to the forefront. Today’s homeowners may choose from a suite of other, newer options, the most fascinating of which involve no ductwork whatsoever. Already popular in Europe and Asia, ductless heating and cooling provides year-round temperature control with unparalleled efficiency. That’s largely because, true to its name, ductless HVAC does not rely on ducts to circulate air throughout the home. 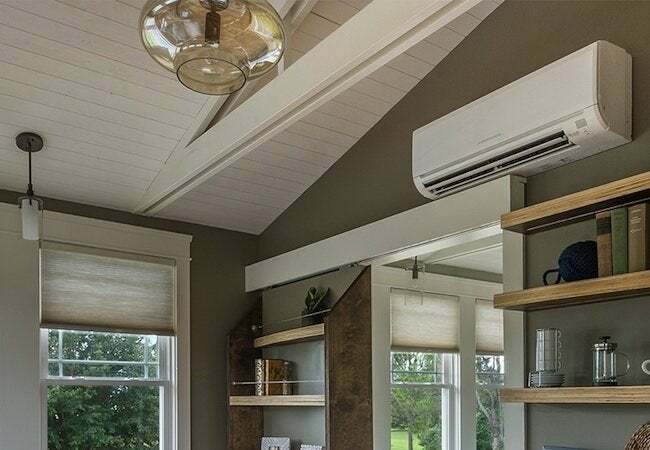 A leader in the category, Mitsubishi Electric, offers a range of ductless systems that, relative to traditional forced-air, cost considerably less to run, even while delivering superior temperature control and comfort. 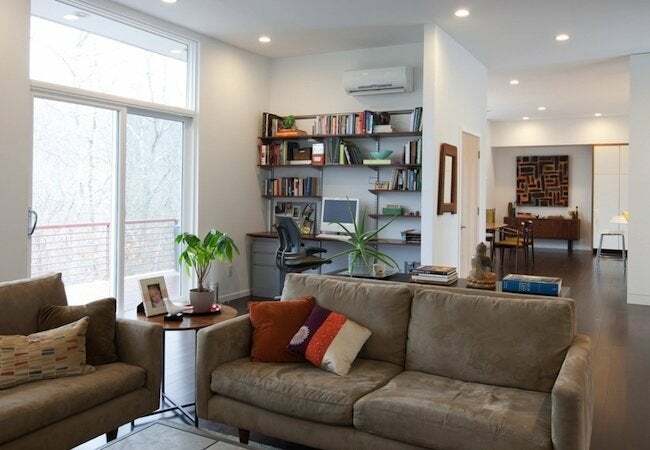 So if you’re reassessing the HVAC in your existing home—or if you’re building a new home or an addition—consider the ductless alternative both for low operating cost and high performance. 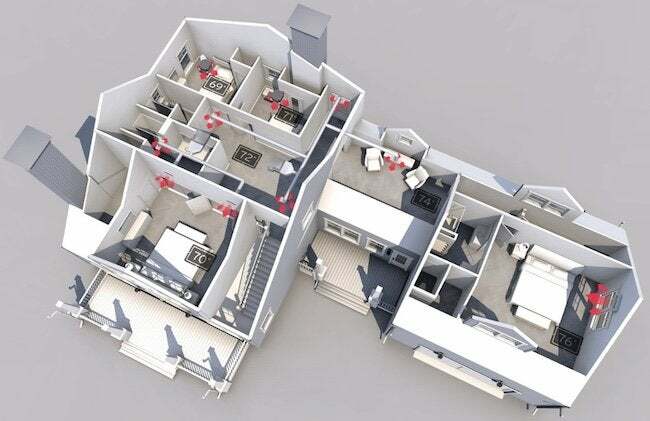 In contrast to the massive, elaborate conventional HVAC configurations to which we’re most accustomed, ductless systems are considerably more compact and straightforward. 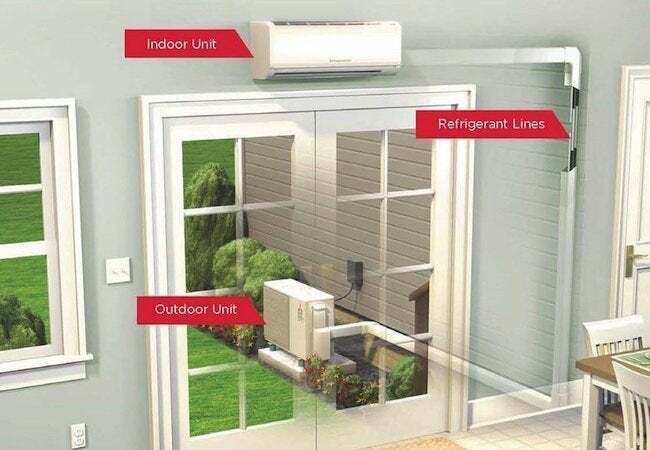 The most basic setup consists of two elements: There’s an outdoor condenser and an indoor unit, with a thin refrigerant pipe connecting the two. Whether recessed or mounted, the indoor unit contains a heat exchanger and fan with variable vanes, the latter to distribute warm or cool air throughout the space. In the warm months, the system collects heat from the home and sends it outside. In cold weather, the system operates in the opposite way: Even in the coldest temperatures, it gets heat from outside and brings it in. Mitsubishi Electric technology finds heat in below zero temperatures to heat your home. Homeowners know the frustration and discomfort of HVAC systems that function intermittently and incompletely, leaving some rooms too hot or too cold. Rather than subject the environment to temperature swings, the Mitsubishi Electric ductless system actively adjusts its output to match the heating or cooling demand. In this way, it avoids the cyclical, start-and-stop operation that creates often unpleasant, sometimes extreme indoor temperature variations. By continuously regulating itself, the Mitsubishi Electric system maintains a steady, comfortable indoor climate. The temperature you set is the temperature you get. Another advantage: In many homes, a single thermostat controls the temperature of the entire house. Mitsubishi Electric rejects the one-thermostat-for-all-rooms solution. Instead, the system enables you to establish different zones, each with its own indoor unit and thermostat. In a multi-zone home, different family members with different preferences can all be comfortable at the same time. In addition, whereas in the past you may have used a space heater or window air conditioner to normalize the temperature in a peripheral room, such as a media room, zoning makes it so that comfortable temperatures pervade every corner of the home. Compared to the typical forced-air system, Mitsubishi Electric ductless systems consume dramatically less energy, enough to save the homeowner 30 to 40 percent on monthly heating and cooling bills. That’s partly because more compact ductless systems require comparatively less electricity to power their normal operation. But it’s also because ductless systems are, well, ductless. Whereas traditional ductwork can hinder overall HVAC efficiency by around 25 percent, Mitsubishi Electric suffers no similar disadvantage. After all, a ductless system distributes air, not through a network of leak-prone ducts, but directly from the indoor unit into the conditioned space. In effect, Mitsubishi Electric cuts out the middleman—ductwork—an entity that, like most middlemen, takes money out of your pocket without adding value. Take zoning into account, too, and Mitsubishi Electric ductless systems become an especially energy-wise choice for the budget-conscious homeowner. Strange but true, in a one-thermostat household, it’s all or nothing: If you want heat or cooling in any room or section, you must heat or cool the entire home, even the rooms you’re not occupying. It’s as if your electrical system were configured so that turning on one light meant turning on all the lights. With a zoned system from Mitsubishi Electric, you can enjoy more rational—and yes, much less expensive—temperature control, paying for comfort only in rooms that people are actually occupying. Indeed, on the fundamental level of system design, newer and smarter ductless systems boast an efficiency edge over older, increasingly outmoded technologies. The installation of a new ducted HVAC system would entail a weeks-long, large-scale remodeling effort. It’s no easy feat to fit ductwork into an existing structure. To do so, contractors must open up walls, ceilings, and floors, and in some instances, make alterations to ceiling heights, room dimensions, or even the home exterior. With home additions and new home construction, installation can be accomplished more quickly, with less hassle. Even then, the plans would need to make accommodations for the path and sheer size of the ductwork. It’s a lot of effort to go through in the name of an HVAC system that can so often be counterproductive, detracting from comfort while unnecessarily driving up utility bills. Owing to their compact, non-invasive design, ductless systems are a great deal easier to put into place. For each indoor unit, there only needs to be one refrigerant pipe running out to the condenser through a three-inch opening. Depending on the size of your home, technicians may be able to get your Mitsubishi Electric ductless system up and running within a single day. In the past, pursuing year-round comfort meant compromise of one form or another. Now, with ductless climate control from Mitsubishi Electric, you don’t have to make any sacrifices. Go ductless and get started with high-performance, customizable climate control designed not only to keep you and your family comfortable year-round, but also to save you serious money each and every month.